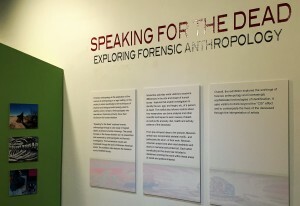 January 2015, I was invited by the Center for Archeology and Society Innovation Gallery in the School of Human Evolution & Social Change at Arizona State University to participate in the exhibition: “Speaking for the Dead: Exploring Forensic Anthropology” I was thrilled to have a few pieces of my art in the exhibition because they deeply relate to death at our US/Mexico border. Upon arriving to Tucson, AZ in 2007after living in Los Angeles, CA for 29 years, I became keenly aware of the deaths along the Sonoran Desert border. As an artists deeply rooted in social, political and environmental issues I began to learn more by working with non-governmental human rights organization; Derechos Humanos, who are deeply concerned about the continued deaths that have occurred on our borders. I had several encounters with life & death on our border, buses full of captured migrants, personally feeling the harassment of SB1070, visiting the Pima County Medical Examiners office and understanding their process of cataloging items from unknown /unclaimed bodies of migrants and hearing the stories of so many. Being a human and working with other people, seeing & smelling death, remains that don’t discriminate on age, I just couldn’t leave them in the freezer, and forget about the countless found just 20 minutes away from Tucson. I painted Los Deconocidos to speak for them and inform others of the travesties on our borders. 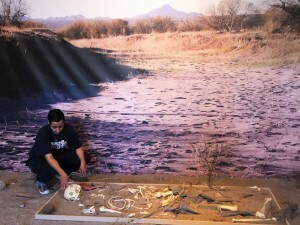 The exhibition was wonderfully curated by weaving together scientific/forensic tools and data along side moving works of art depicting the death that occurs on our U.S./Mexico Border. Successfully combining ASU faculty research, interactive displays, artwork and multimedia presentations in an experience designed to engage visitors on multiple levels.